Hummus-lovers, are you sitting down? Because I have a recipe that's about to rock your chickpea-centered world upside down. So indeed, people love hummus. Even your gluten-free, dairy-free, vegan, vegetarian, juicing friends (no really, it's Blueprint #7) cannot refuse it. The texture is just so smooth, and the dipping options so plentiful, and that rich, earthy, nutty undertone...what is that, chickpeas? Olive oil? No! It's tahini, the real star of the hummus party; taking center stage in this delightfully, inextricably addictive, Butternut Squash & Tahini Spread. Hold that pretzel thin or celery stick right there, and let me explain. Tahini is sesame seed paste. It is made by soaking sesame seeds in water, crushing them to separate the bran from the kernels, skimming the kernels off the surface, toasting them (sometimes), and grinding to produce an oily paste. After all these steps, we are left with our beloved ingredient in all its nutrient-filled glory; boasting an exceptional source of copper, manganese, amino acids and omegas; plus high levels of calcium, protein and "good" fats. But if tahini can have this effect, this butternut squash spread is the Hercules of them all. When the slightly acerbic seed is paired with sweet earthy squash; slow roasted in cinnamon, creamy Greek yogurt, and syrupy sugar; the combination is so spot-on that one bite equals total taste transcendence. The texture of this spread is out of this world, too. While hummus is inherently creamy, the denser butternut squash contributes a chunkier fluidity, kind of like perfectly smashed mashed potatoes. Because of this, it almost doesn't even need vegetable sticks or pita chips to serve it with—I am definitely guilty of eating at least half the portion straight from the plate with a spoon. In fact, the consistency of the spread gave me an idea. Recalling a grilled sea bass I'd ordered once that had come served a top a plantain mash, I decided to mimic the dish, swapping plantain mash with my butternut-tahini spread. Instead of serving as an appetizer, I marinated a flaky white fish in balsamic vinegar, sautéed some swiss chard with onions, and distributed the butternut-tahini spread onto the plate, topping with the fish and then greens. Yum! 2. 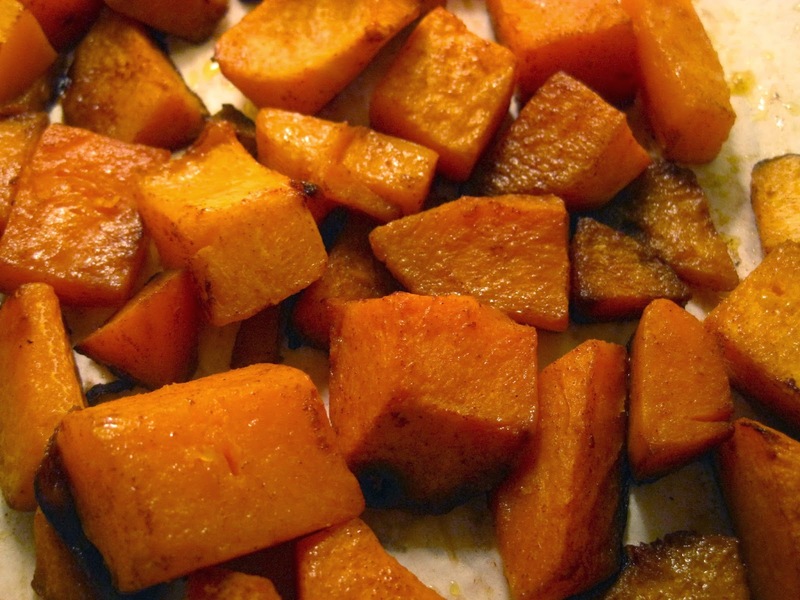 Spread the squash out in a medium roasting pan. Pour over the olive oil and sprinkle with cinnamon and 1/2 teaspoon salt. Mix together, cover the pan tightly with aluminum foil, and roast in the oven for 70* minutes, stirring once during cooking. Remove from oven and let cool. *My squash cooked in about 45-50 minutes. Once you hit this mark, keep a close eye on your squash as it might be finished sooner. Oh these Fudgy Vegan Beet Cupcakes are so beet-autiful. I was thrilled to see another vegetable join the dessert realm next to the avocado and pumpkin; but kept my excitement in check because the thought of a vegetable-centric cupcake sans butter and eggs that was actually tasty seemed to good to be true. But now that I've made them, and they are delicious, I can rejoice without abandon. 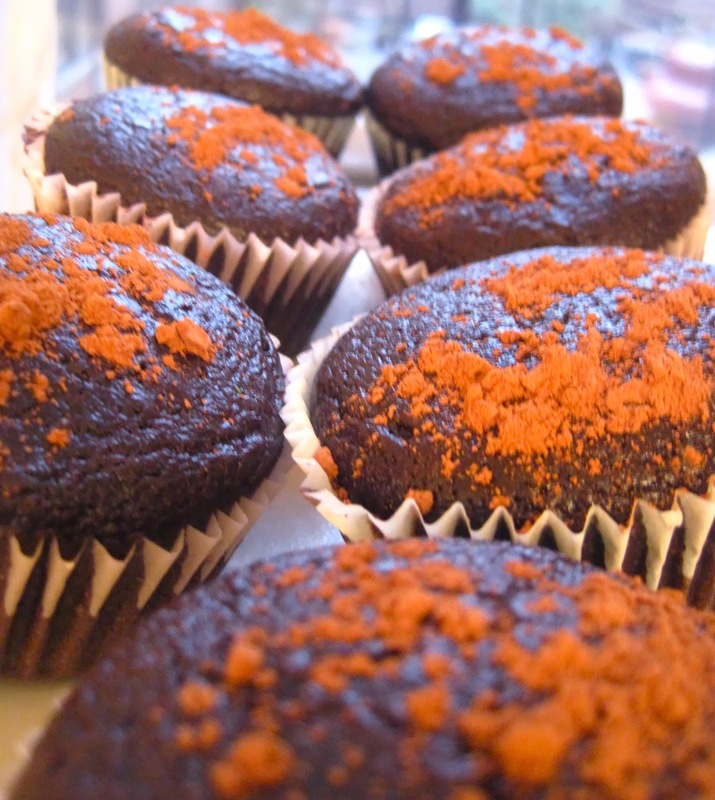 These cupcakes are chocolate, fudgy, rich, moist, and delicious. They rival any other chocolate cupcake and they are not even bad for you!! Make them. I insist. This recipe is about as easy as a cupcake recipe comes; it requires just one bowl and less than a dozen ingredients (most of which you likely already have in your pantry.) While I cannot deny the superiority of a fresh oven-roasted beet, here, vaccum-sealed cooked beets offer a great alternative and save lots of time and mess. The cupcake batter tasted like chocolate pudding and I could've eaten the whole thing straight out of the bowl. Seriously, it's not like there were any raw eggs in there to stop me! 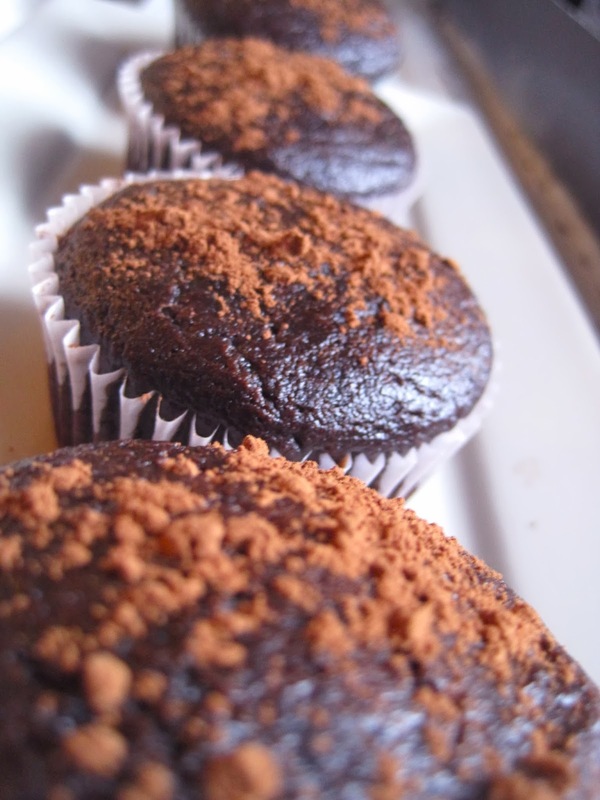 The silky, creamy vanilla almond milk blends blissfully with the raw cocoa; and the beets add a juicy sweetness that upon baking yield a rich, fudgy cupcake light as a feather. Dana of the Minimalist Baker (where this wonderful recipe hails from) swears you don't even need frosting because the cupcake is so hearty and delightful on its own. Instead, she serves with a smattering of fresh cocoa powder on top. While I do agree that frosting here is not essential (especially if you're keeping the healthy factor in mind,) I couldn't resist trying a few with a homemade vegan buttercream to really contrast the chocolate and vanilla. I wanted to add some beet juice to the buttercream frosting to make it pink and further celebrate my newly discovered union of beets and chocolate (to the beet of my heart! ok I'll stop) but I spilled my reserve beet juice all over the counter. So although these cupcakes are only black and white, you will have to take my word that I do truly love them. One final note: I made both the cupcakes and frosting using an immersion blender; so if you don't own a proper egg beater do not worry! However, if it is a light and fluffy frosting you seek, I do recommend utilizing an electric mixer. Although delicious, my frosting was droopy and not as aesthetically pleasing as it could've been. 2. Line a muffin pan with paper liners. 3. Whisk together the almond milk and vinegar in a large bowl, and set aside for a few minutes to curdle. Add the sugar, oil, vanilla extract, and 1/2 cup beets and beat until foamy. 4. Add the flour, cocoa powder, baking soda, baking powder, and salt to a sifter and slowly sift it into the wet ingredients while mixing with a hand-held or standing mixer. Beat until no large lumps remain. 5. Pour batter into liners, filling 3/4 of the way full. Bake 22 to 25 minutes, or until a toothpick inserted into the center comes out clean. Transfer to a cooling rack and let cool completely. Do not try and unwrap them or they’ll stick to the wrapper. 6. Once cooled, dust with cocoa powder (or vegan vanilla buttercream, recipe below) and store in an airtight container to keep fresh. 2. Gradually add in confectioners sugar, starting with 1 cup and mixing slowly until fully combined. 3. Beat for about 5-10 minutes until nice and fluffy, or with a handheld mixer for at least 4-5 minutes.